I now know that I missed many must-see's on Scotland's Textile Trail, but have no regrets. With fewer than 24 hours to plan a 10-day trip that did not rely on a car, we hit a lot to textile highlights. The exhibit celebrating Pringle of Scotland's 200th anniversary was one of them. Perhaps best known for its cashmere sweaters, twinsets and Argyle sweaters, Pringle of Scotland has been a fashion icon for years. Conveniently located near the Scottish galleries at the the National Museum of Scotland, the exhibit covers a lot of time and progress in a small space. The location is appropriate as Scotland is recognized as the historic birthplace of the knitwear industry. And Pringle of Scotland, which was established in the Scottish Borders, is one of the oldest fashion brands. As undergarments progress from 'peeking out' to becoming outer garments in their own right--think, bustiers, camisoles, and lacy slips, to name a few--who would have guessed that the transition began more than 100 years ago? The exhibition, Fully Fashioned: The Pringle of Scotland Story, is well done. Now known as a luxury brand, its beginnings were, well, rather stodgy. Practical, yes. Fashionable, no. The company's roots are in underwear and hosiery. Surely that was good business in Scotland where the cold is ever near, even in July. But a business like Pringle's doesn't survive for 200 years without change. And Pringle has definitely changed. 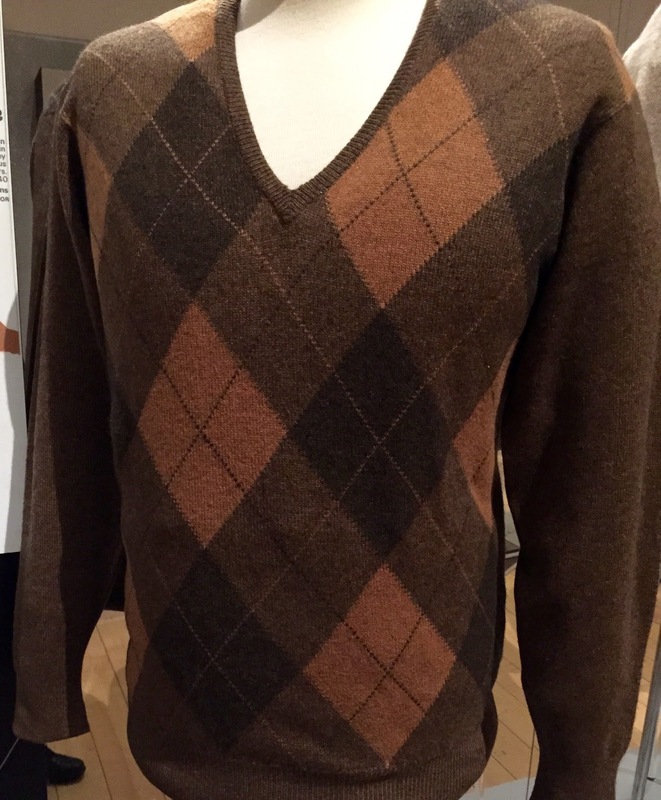 The exhibit brings together a collection of representative knitwear samples over the company's 200 years. Most were from knitwear collections, but in at least one case, the women's golf sweater, the item was "reknit" based on surviving photographs of women golfers in the 1920's. 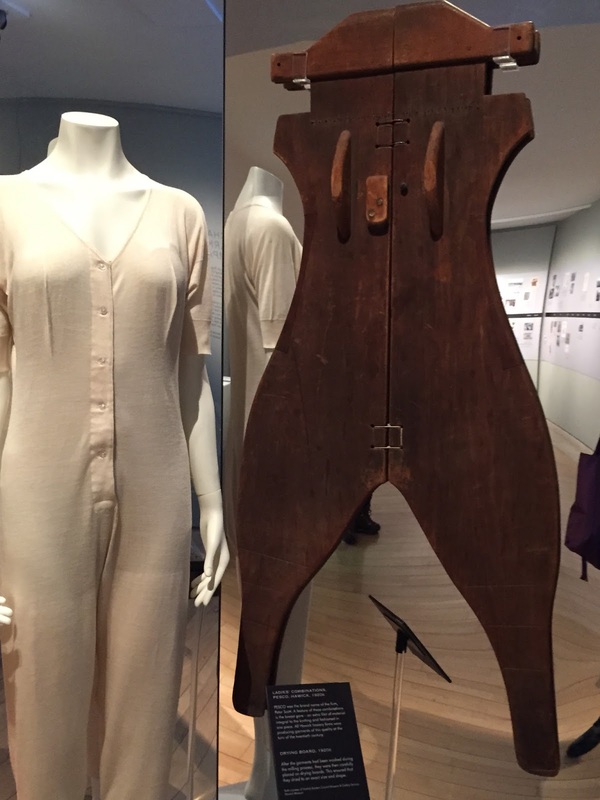 A walk through the exhibit takes the viewer through not only changes in fashion, but some of the challenges the company faced in the fashion business as it evolved--and sometimes struggled to remain a highly regarded luxury brand. According to the exhibit's timeline, Pringle first introduced knitted garments as outerwear in 1905. 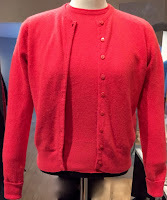 An accompanying illustration shows a short, close fitting, waist-hugging sweater with front buttons and decorative yoke. The company added silk stockings in 1927--a fashion statement at the time. 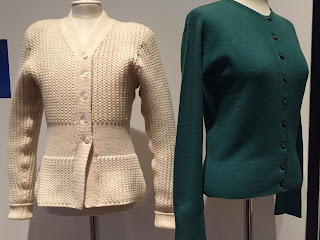 And beside it, the classic round-neck button front cardigan (above right). In 40 years, the sweater has gained ease and length. Who would call this vintage? By the mid-1950's, Pringle had become media savvy. The company used Hollywood actresses as models promote their products. They also invested in top-name designers, updated their look and their promotions. My husband fondly recalls how much he yearned for a Pringle sweater in his college years. He never owned one, but the time aligns with Pringle's promotions and the introduction of its men's Ryder Cup golf shirt. Contemporary garments include high fashion garments, as well as classics. 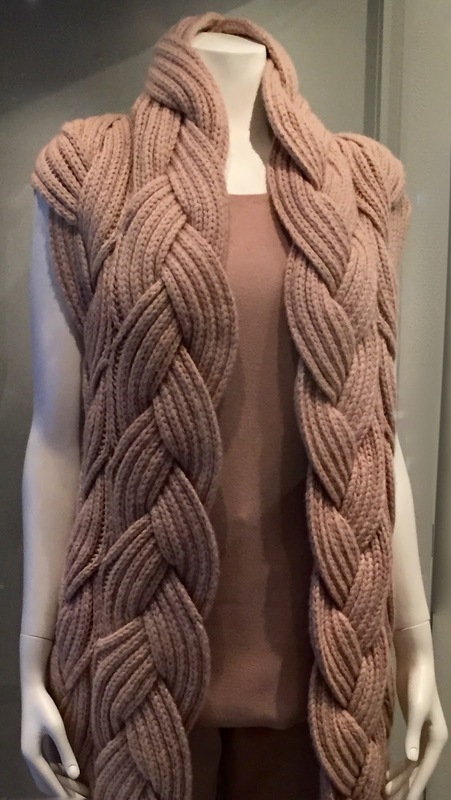 Most knitters I know would drool over the hand knit Look 11 in their Women's Runway Collection of Autumn/Winter 2015 collection shown in the top right photo. And then they'd try to figure out how to knit it. The exhibit runs at the National Museum of Scotland in Edinburgh until August 16, 2015 and is definitely worth a visit. And if you can't make it, check out the museum's slideshow here. Ah, I have fond memories of twinsets! Those of us of a 'certain age' 'had' to have at least one, right? 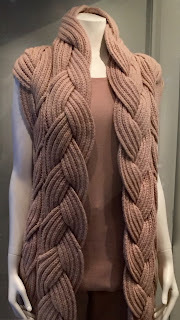 Fast forward to now: Have you figured out how to knit the coat at the top?